The M.L.E./S.M.L.E. 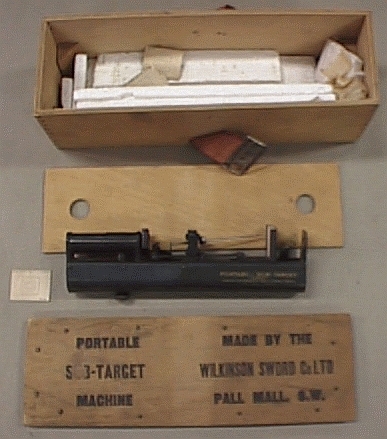 mounted Sub-Target device by the Wilkinson Sword Co. The Wilkinson company, in addition to the licensed sub-target machine, also manufactured their own device which clamped to the barrel or nose-cap of either the .303 inch calibre Magazine "Long" Lee-Enfield or S.M.L.E. "Short" rifle. The example shown is for use with the "Long Lee", but we believe that an extension bracket was manufactured to permit fitment to a "Short" Lee-Enfield's bayonet fixing on the nose-cap. The entire rifle attachment is just under eight inches in length..
Little else is known of this very early Twentieth Century piece of equipment. The unit photographed here is held in the Ministry of Defence Enfield Pattern Room collection (images by their courtesy) - which collection has since been transferred to the Royal Armouries at Leeds. The device operates on a principle similar to that of the sub-target unit for the 1896 Swedish Mauser rifle. Above: the target - slightly larger than full size. The actual width of the whole target card is one and three-eighth inches, and the central target is only nine-sixteenths of an inch square. 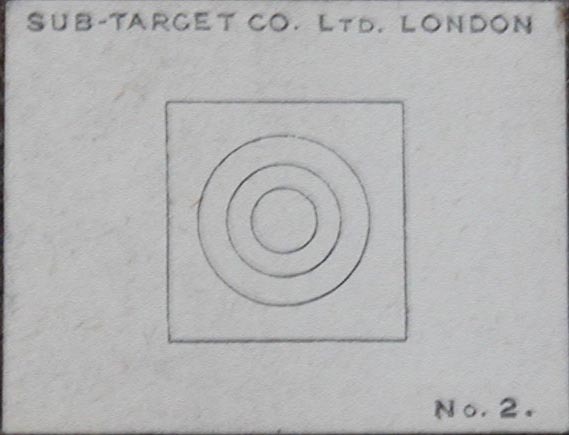 That shown is the McQueen's Target No.2 for the device, and the alternative Target No.1 has a central 'head and shoulders' figure replacing the round bull. These targets fitted into the device as shown above, and are solely for registering the 'hits' made by the needle point when the trigger is pulled. The aiming mark is a larger but identical target at approximately ten yards distance, and then available in various sizes representing the respective full-size First Class targets used at 200,300,500 and 600 yards in musketry practice at the time.